This file photo shows a shopper checking out an Apple iPad at a computer mall in Hong Kong. A Taiwan-linked company which claims ownership of the iPad trademark in China has filed lawsuits and lodged complaints against Apple for infringement, according to a lawyer. 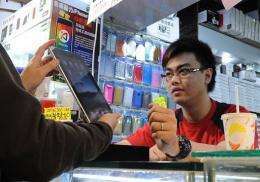 A Taiwan-linked company which claims ownership of the iPad trademark in China has filed lawsuits and lodged complaints against Apple for infringement, according to a lawyer. Apple lost a legal battle against Proview Technology (Shenzhen) last year after a Chinese court ruled the US company lacked evidence in its claim that Proview was infringing its trademark for the iconic tablet computer. Xie Xianghui, a lawyer for Proview, which is based in the southern city of Shenzhen, said the company had now filed lawsuits through the courts and made formal complaints to the government after the ruling. "We are requesting a halt to this trademark infringement," he told AFP. Apple did not immediately respond to a request for comment on Tuesday. Proview Technology (Shenzhen) is owned by a Taiwanese company that registered the trademark name "iPad" in several countries including China as early as 2000, years before Apple began selling the product. Apple bought the rights for the global trademark, but Proview Technology (Shenzhen) retained the Chinese rights, the official Xinhua news agency has reported. The China-based company has previously asked Apple to pay 10 billion yuan ($1.6 billion) in compensation for trademark infringement. Proview had made a formal complaint to a branch of the Beijing Industry and Commerce Administration, as well as the same government agency in two other Chinese cities, which could result in fines for Apple, he said. The company was also pursuing a lawsuit against Apple in Shanghai and had sued two household appliance retailers to pressure them to stop selling iPads, Xie added.